Engineered for reliability. Built in the USA. We engineer and build our ozone generators and distributors in the USA assuring the highest standard of quality control. Integrated monitoring & alarm management. Our propriety remote monitoring system checks its sensors 1440 times a day to keep product treatments optimized and employees safe. We regularly update your hardware, firmware, and software so you benefit from our latest technologies. TriStrata ozone systems are specifically designed to improve safety and quality performance for food processors, distributors and storage facilities. Historical performance data is logged to support compliance audits, accountability and traceability. TriStrata has the largest nationwide field service team to execute planned maintenance to reduce disruptions and improve performance. Aqueous Ozone, ozone dissolved in water, are used by Meat & Poultry, Seafood, and Fruit & Vegetable facilities. 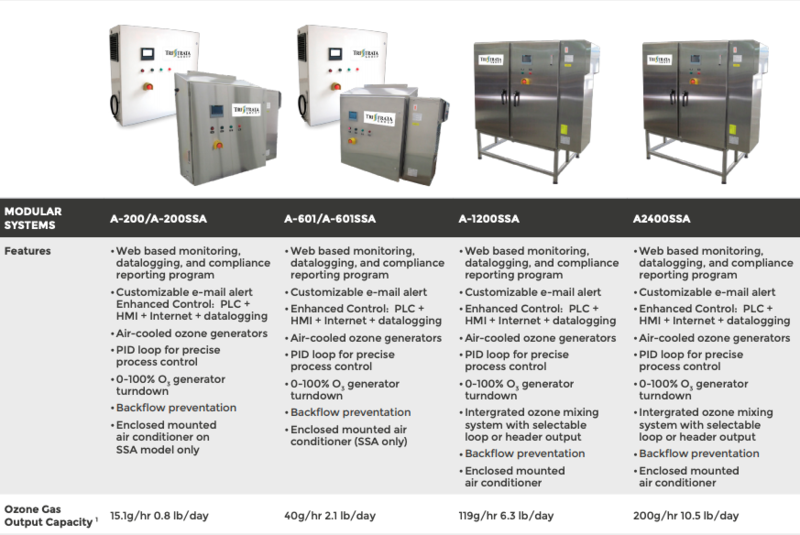 Ozone is used to improve food safety and quality by controlling pathogens on product as well as for sanitizing contact surfaces such as belts, drains, floors and processing equipment to improve plant cleanliness. Ozone gas is used for room disinfection purposes to control cross-contamination and defend against pathogens in high-risk rooms that can’t be sprayed down regularly, such as packing and drying rooms, coolers, freezers etc. It is generated onsite and dispersed throughout rooms by fan or through ventilation systems.